Lot:9442 Fr. 2309. 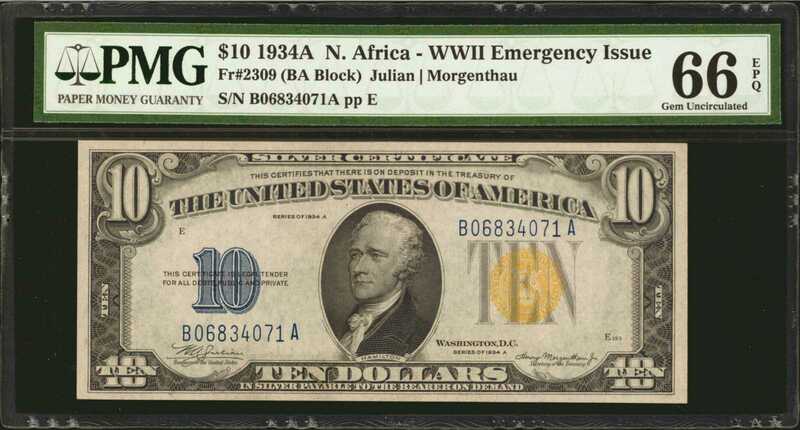 1934A $10 North Africa Emergency Note. PMG Gem Uncirculated 66 EPQ. Fr. 2309. 1934A $10 North Africa Emergency Note. PMG Gem Uncirculated 66 EPQ.Superb and nearly superb $10 North Africa notes are surprisingly underrated when one considers how much tougher they are than Choice and lower-end Gem notes. The last pristine note that we sold was at this same PMG Gem UNC 66 EPQ grade level and it realized $960.